I thought I’d share the summary poster from that GRAIN paper on African farmers’ seed systems that I just Nibbled. I may blog in more detail about this, but for now let me just say that even if you fully agree with all this it’s still possible to see a role for “formal sector” genebanks, as back-ups and facilitators of (especially long-distance) germplasm exchange. Why doesn’t the paper recognize this? 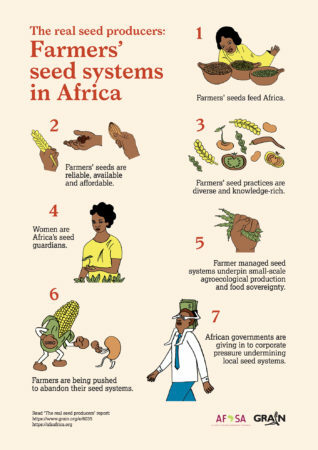 Even if farmers’ seed systems do feed Africa, do they necessarily have to do it on their own?